Along the way you’ll broaden your knowledge of JSF components and web APIs best practices, and learn a great deal about the internals of JSF and the design decisions that have been made when building the JSF API. For example, you’ll see what artefacts are now CDI injectable, how CDI changed JSF internally, and what some of the caveats are when working with the CDI versions of a JSF artefact. Furthermore, you'll build an example application from scratch. 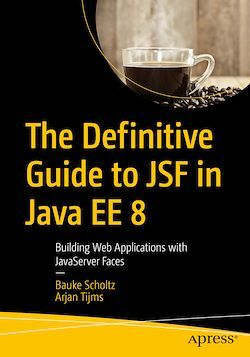 After reading The Definitive Guide to JSF in Java EE 8, you'll be ready to build your own efficient and secure web applications. Existing JSF or Java developers who need to create a web UI. No prior knowledge of JSF is required, but the book does skew towards the more experienced developer. Concepts such as dependency injection and MVC are assumed to be known, as is a general knowledge about HTML, HTTP and other web standards.